Starting At 500 Pounds: I found a dam photo of fat me! Fat me is at the Hoover dam last summer thus the seemingly misspelled expletive in the post title. Sometimes I stumble across an old picture I forgot I had and get to revisit the fat me again. It is so weird. Makes me angry and happy at the same time. Mother's Day was nice but I failed in the gift department. Karlie let me slide with an IOU on the gift. Me and the kids made her breakfast in bead. On a side note, gift giving is harder when your wife is a florist who is on a diet and you are broke as a joke. I have to get creative. After I made her breakfast I made some corsage deliveries to the Moms in the family before church. As always, everyone was thrilled to receive Karlie's beautiful orchid corsages and Karlie was thrilled to stay in bed while me and the kids made the deliveries. After church Karlie enjoyed some alone time going through shows on the Tivo while the kids and I took a nap. After that, we headed over to Karlie's mom's house and visited for a while. Dinner at my mother in-laws is to hard for us because the food is so good and we can't have most of it. Potato salad is Karlie's favorite and she couldn't stand to be tempted so we ate dinner before going over. After making a good choice like that, I ate some leftover Easter M&Ms out of the candy dish....stupid. Cody, my ripped, college football Champ, Brother In-law & his wife Amber are staying at Mom Larsen's for a while and he helped me work out a regimen to start gaining some muscle while I am losing weight. I have been reading a lot about body building and know that as I gain muscle I will slow down my weight loss but not necessarily my fat loss. My new goals will be weight related still but I think I am going to need to focus on body fat % loss as a more accurate measurement for my goals going forward. If I am doing this right, I should see the % drop every week and still be dropping pounds overall. The weight lifting is going to be in 2 cycles that last 6 weeks long each. One cycle is strength training and the other is heavy lifting. I am starting with the strength cycle first. One thing I loved that Cody pointed out is that if you are doing the weight lifting right, your heart rate should stay up the whole time. He suggested working out by myself or with someone who wants to work even harder than me. Great advice. I need to make the limited time I have at the gym count so you won't see me just hangin' around between sets very long. I miss reading and commenting all on the weight-loss blogs I follow. I need to set aside some time because it motivates me and gives me the umph I need in my weekly weight loss efforts. I feel so out of the loop with everyone and their struggles and successes. Even if I don't comment I will be blog stalking this week for sure. I've got to admit, I read the title and I thought, "Oh great, someone that can't spell!" Then when I read the first line I thought, "Great! Someone that understands how to play with words!" Whew! I know what you mean about looking at old photos though. Some days I think I've come such a long way and other days I get mad that I was even that big. AWESOME Mike, you are looking awesome. Keep it up. you are lookin good...AND the best gift I ever got from my husband was the time he dug sea shells for me in 2001. It was very special...I still have them. pick some daisies. That's romantic...take her to the park and lay out a blanket and some fruit and sparkling grape juice....that would be special. Well that photo may make you sad but it has to be motivating to see how far you've come Mike! May I say, this line made me laugh right out loud: "On a side note, gift giving is harder when your wife is a florist who is on a diet and you are broke as a joke." Maybe you should have said it to her! I can definitely relate to not feeling like you have enough time to comment/read other blogs- shoot sometimes I feel like I don't even have time to write my own! Anyways, keep writing- I love reading about your journey! Sounds like you are making great progress! 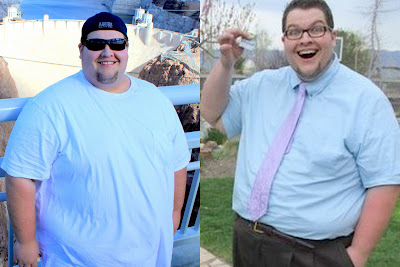 I love to read your blog since it really is an honest account of the weight loss journey. I have shared your blog with several others who are going through similar life changes. Good choice on changing over to body fat %, that will make a big difference since you are starting weight training! Just make sure to find someone qualified to do your measurements for you so they are accurate. Anyone can lose weight, losing fat is the key!! Daaaaaaaam Gina! Every once in a while I'll come back to look at this pic and I don't think it's real. It makes me excited about my life all over again.